Bumblebees are social creatures and have an interesting lifecycle. They live in a nest ruled by a queen who is helped by smaller female (worker) bumblebees. The lifecycle begins in spring, when rising temperatures awaken a queen bumblebee that has been hibernating alone in the soil. The queen will have spent the entire winter underground, using up reserves of energy stored as fat in her body. When she first emerges, she feeds on flowers, drinking nectar to gain energy. She will then begin to search for a suitable nest site. Frequent nesting sites include holes in the ground, tussocky grass, bird boxes and under garden sheds. When she has chosen her nest, the queen will begin to collect pollen from flowers, to bring back to the nest. She forms a mound of pollen and wax (which she secretes from her body) and lays her first brood of eggs. She also collects nectar which she stores in a pot-shaped structure made of wax which is positioned in front of her mound. The queen keeps the eggs warm by sitting on her wax ‘nest’ and shivering her muscles to keep warm. Sipping from the nectar-pot gives her enough energy to incubate the eggs for several days until little white grub-like larvae emerge. These larvae are fed on pollen and nectar which the queen goes back-and-forth to collect from nearby flowers. Once they have eaten enough, after around two weeks, they spin a cocoon, inside which they develop into adult bees. This first brood of offspring are all ‘worker’ females, and will carry out work inside and outside of the nest. Some will guard or clean the nest, while others will forage for nectar and pollen from flowers. Some of the nectar will be consumed by the working bees, but much of it will be brought back to the colony to feed to other workers and the next batch of offspring. From this point on, the queen will not leave the nest. Instead, she will remain inside, laying more eggs and ordering her workers around. As the season progresses nests begin producing offspring which are not workers. New queens (females) and males are produced in order to allow the colony to reproduce. The male bees leave the nest and do not normally return. They do not collect pollen and spend their time feeding on nectar from flowers and trying to mate. New queens leave the nest and mate soon after. Mating behaviour varies between species but typically involves several males competing in one way or another. Most males never mate. Once mated, new queens feed heavily on pollen and nectar, storing the energy as fat inside their bodies. This fat will be used to provide energy during a long hibernation. The old queen and her nest will naturally come to an end as summer turns into autumn. Only the new queens survive until the following spring, by hibernating underground. Cuckoo bumblebees are a group of related species that are descended from ‘true’ or ‘social’ bumblebees. However, cuckoo bumblebees, like their namesake the cuckoo bird, use the nest of true bumblebees to raise their own offspring. The female (there is no queen) cuckoo bumblebee enters the nest of the true bumblebee, and often hides in the nest debris for a while. 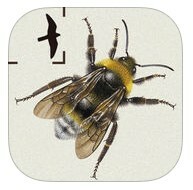 Eventually, the cuckoo female may kill the social bumblebee queen, and lay her own eggs in the nest. 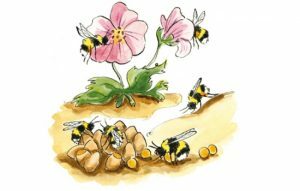 The worker bumblebees will then unwittingly raise the offspring of the cuckoo bumblebee, without realising that they are not related to them. The cuckoo bumblebees become adult bumblebees that leave the nest and mate with others of the same species, before the females go into hibernation.